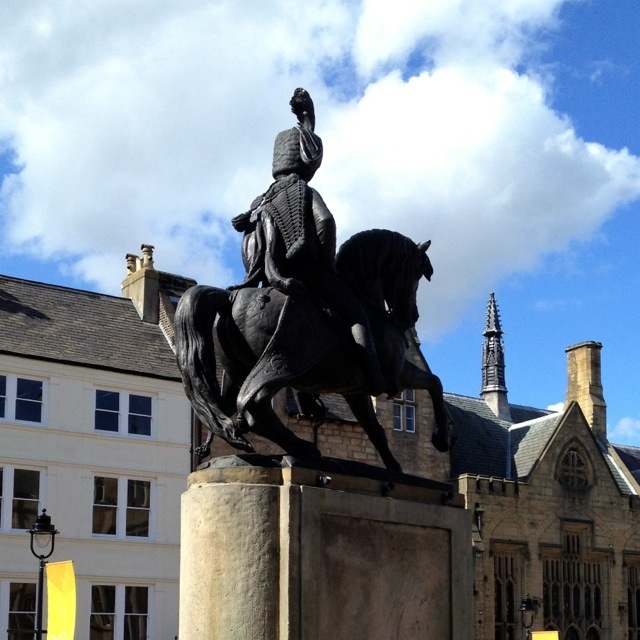 This is a really bad photo of perhaps Durham’s most famous statue: that of the Marquess of Londonderry, Charles William Vane Tempest Stewart. He was an Irishman, born in 1778 in Dublin. He became a politician, soldier, and owner and developer of a lot of land. If you’ve an astounding memory, you’ll recall that I’ve mentioned this family before: they owned both Wynyard Hall in County Durham and Mount Stewart over in Northern Ireland. But here’s another connection between County Durham and County Down: Charles William Vane Tempest Stewart’s other memorial is Scrabo Tower. Wendy often says we should go for a walk near Scrabo Tower when we’re visiting her family, but she’s never taken me yet! This 1,773rd post was filed under: Photo-a-day 2012, Durham.